Item # 315671 Stash Points: 2,500 (?) This is the number of points you get in The Zumiez Stash for purchasing this item. Stash points are redeemable for exclusive rewards only available to Zumiez Stash members. To redeem your points check out the rewards catalog on thestash.zumiez.com. 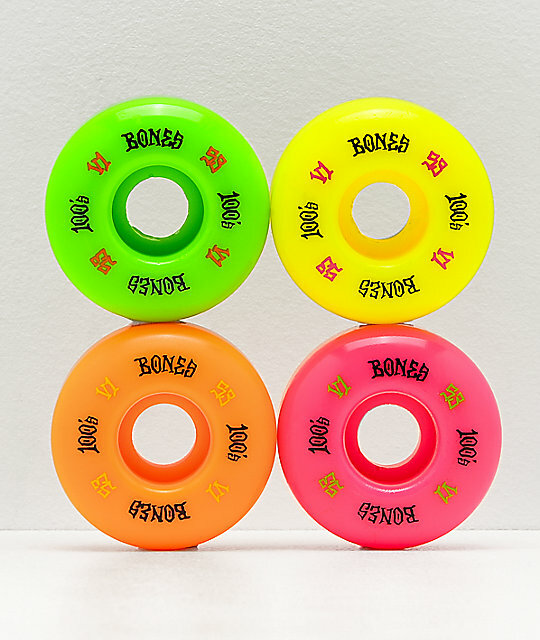 Mix up your current wheel setup with the Bones 100 Ringers Mixup 53mm 100a Skateboard Wheels. This multicolor pack of skate wheels feature bones classic V1 shape for a predictable feel with traditionally rounded edges. A 100a durometer rating maintains a mid-range level of grip, for traction when you want it and premium power slides when you want as well. Virtually flat spot proof, you will be riding these wheels for several decks to-come. 100 Ringers Mixup 53mm 100a Skateboard Wheels from Bones. 53mm size, 100a durometer rating. Multi-color pack of four wheels, green, yellow, pink, and orange included.